It all started with a kiss. 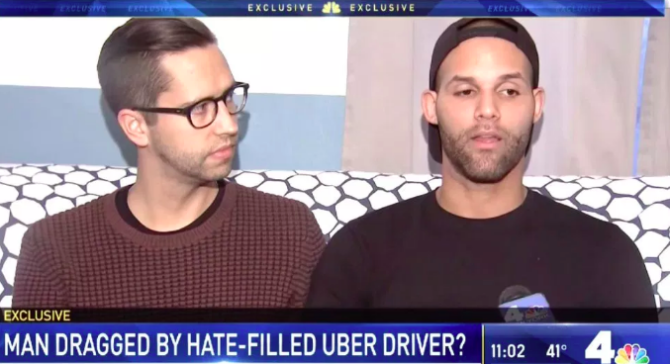 Taray Carey and his husband Alex Majkowski were riding in an Uber from the East Village when they shared a brief kiss in the backseat, prompting the driver to fly into a fit of rage. Eventually, the driver, identified on the app as “Denis”, pulled over. But as Carey was trying to exit the vehicle, Denis allegedly gunned the engine, dragging Carey along the ground down the street while Majkowski watched helplessly from the backseat. Carey was dragged along the road for a quarter of a block, leaving him with bloody scrapes on his hand, knee, and hip and a large welt on the back of his head. Majkowski was eventually able to escape the vehicle when the driver pulled up to a red light a short while later. As he sped away, the couple called police. Carey says the first NYPD cops to respond to the couple’s complaint didn’t take them seriously. After reviewing body camera video from the responding Police Officers, at no time did any of the officers mock the victim, tell him that he probably deserved it or laugh at him. A complaint report was filed for leaving the scene of an accident with injury and is being investigated by the 9th Precinct Detective Squad. Meanwhile, Uber says it is looking into the incident. Carey was refunded for the ride and “Denis” has had his account suspended. Uber needs to start paying for the medical care of its customers that are the result of the violent actions of their drivers. That company is far to greedy for that. The barbarian savage needs to be arrested immediately, Uber needs to be sued, as should the driver. This is beyond the pale; the man is obviously a child, if a mere kiss drove him insane, then he needs to seek medical attention, in Russia. I don’t think Uber can be sued as it’s not formally his employer. Although NY might be different. Yes. That was a felony assault. Should be enough to boot the bigot back to his shithole country. Hmm…that’s a pretty specific allegation against the cops. Is it possible they can edit or turn off the body cam camera? I have never taken Uber or Lyft, nor do I ever intend to. Feels like every week there is another incident between gays and one of these operators. I’ll go with the Union run cab companies or public transportation, thank you. My husband and I have NEVER had problems with Yellow Cab in our travels. I suggest you talk to a person of color who has been refused a ride due to their heritage or somebody living in the outer boroughs of New York City where many Yellow Cabs simply won’t go. Better yet, why don’t you get to know an actual Uber driver? I was one of them back in college, and it was a good experience. Holloway: I drove a cab in college. And the actual reason Blacks are passed by is simple economics. The vast majority refuse to tip. A good percentage of your money earned per shift is in tips. And if a driver has a choice between a White fare and a Black fare they will go with a White fare. This isn’t bigotry or racism. It’s a matter of trying to earn as much money as possible per shift. And before anyone starts throwing a hissy fit, ask a Black cab driver, they will 100% Co-sign…..
Pigs, I mean cops, lie all of the time. They lied when saying they didn’t put Eric Garner in a chokehold, when passerby video clearly showed they did (as punishment, the NYPD politically targeted the man who filmed the video, Ramsey Orta, and he’s currently in jail and threatened with murder by corrections officers). They lied when saying that there isn’t an illegal quota system. They lied when saying they don’t support Trump and his fascist supporters, the Proud Boys. There’s no reason to believe that this incident is any different, especially since they are known to delete body camera footage that is unflattering to them. There should be more outrage about this than there is. Our community needs to wake up and stop pretending that cops are anything other than any enemy to us, no matter the rhetoric to the contrary or the hot cops fetish stories on this site. They gain nothing either way. Yeah, Chrisk, because gay folks have never lied or exaggerated with their media posts and oppression claims. (Remember that waitress chick who wrote anti-gay stuff on her own check and passed it off on the customer.) Maybe these guys were so shaken up they don’t accurately recall what the cops told them. Or maybe they were simply pissed off and are self-dramatizing queens who want attention. Or, maybe the cop said that, although I’ve never experienced that kind of behavior from a cop. Although I have experienced my fair share of drama from hysterical queens. lol. Their business model is that of an unlicensed cab company. One reason that they are profitable is because they can compete with licensed taxi cabs without the expense of regulations, which screen out psychopaths like “Denis.” They have to appear to be concerned about incidents like this, but they know that their business model makes such incidents inevitable. That couple was contributing to the problem by using an unlicensed cab service and pushing regulated, licensed taxi companies closer to extinction. I think New York’s a little more strict when it comes to regulations though. Regulations on people trying to earn an honest living are the problem. Go ask any person of color who’s been refused a ride in a licensed, regulated Yellow Cab in New York City. Why do you think they arbitrarily set a low limit on the number of medallions they issue? Cronyism at its worst! Uber and Lyft are a godsend For millions of Americans. And it actually gives you a better living in many cases than working for a licensed regulated Cab Company. @Holloway – Nearly every cab driver in NYC is a “person of color.” So I have no idea what the h you are talking about. The number of medallions is limited in order not to dilute the value of the medallion and to ensure that cabbies can survive. They are also limited because city streets can only bear so much taxi cab traffic. I live in NYC and have interacted with lots of cops, twice in relation to gay bashing incidents. No cop I know or have ever encountered would say, “you probably deserved it.” The uber incident should be investigated, but coloring your case with doubtful or exaggerated claims ain’t the best strategy. Are you white or a person of color? Just wondering. 1. NYPD says the body camera footage indicates the couple was lying. They need to release that footage asap. 2. Russians are homophobes, but they don’t typically behead gay people, that tends to happen in homophobic Islamic countries like Iran or under Daesh. 3. We don’t know what happened yet. If the driver really dragged the poor guy then he should be permanently kicked off of uber and charged with assault. 4. But knowing how New York has recently gone on a crusade against Uber and Lyft, both of which provide good employment for immigrants and rides for people of color while resisting the corruption of the notorious Taxi and Limousine Commission… this might just be an anti uber hit piece. 5. We need the facts. If it happened there’s video of it, since NYC has had cameras all over the city, especially in Manhattan, Brooklyn and Queens since Giuliani was mayor. I don’t doubt that the incident happened, and given what NYC cops can be like, especially to black and brown New Yorkers, I also wouldn’t surprised if the cop made that statement. I’ll just say that one of the craziest Uber-Lyft drivers I’ve ever encountered in NYC was Russian, and he was making somewhat crazy (but not racist or homophobic statements), but his name was *not* Denis. My nutty Uber-Lyft driver kept raging about an ex, who was female, and drove like he wasn’t exactly familiar with NYC traffic laws. More facts then we will find Denis ourselves, let’s see what he thinks when we’re through. His behavior if actual is Pathetic at best. And remember Denis your not in your Country Now and we don’t five five cents what they do there. And apparently you fled to here for some reason?!? Don’t be a pig in the future, this isn’t finished bud. I totally believe what happened. In fact I was told by a police officer that I should expect it living my type of life. It was bull. Ironic that this horrific incident happened in one of the most liberal cities of America. And that it happened at the hands of someone who was freely allowed into the United States without that strict vetting process in place. This is what happens when you insist on keeping open borders and allowing anyone in if they want to come in. You bring in people who are used to a homophobic view from the country they came from. You can counter that with there are American born homophobes too. Great, then we have more than enough and don’t need anymore. Homophobes are everywhere, even in liberal cities. Just like racists, anti-semites, and sexists. We’ve seen way too many of these gay bashing/homophobia stories turn out to be lies for me to take them at face value anymore. And this one, with the cops showing up on the scene, laughing in their face and telling them that they probably deserved it? Sounds like total BS to me.